Spending money in Tahiti is one of the most common topics our travelers ask about before departing for their trip. When should I use credit cards? How much cash should I bring? Is it easy to exchange foreign currency? Is tipping common? If you have some of the same questions, you’ve come to the right place. Here are some top tips from our Tahiti Travel Experts. 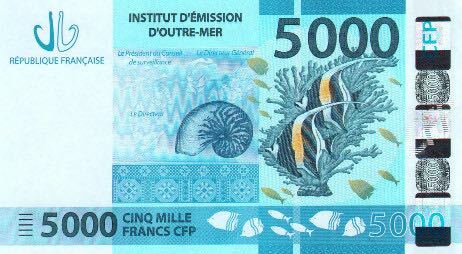 Tahiti’s currency is the French Pacific Franc (XPF or CPF), which is tied to the Euro and fluctuates against the US Dollar. As the dollar increases against the Euro travelers will also see their dollars go farther in Tahiti against the French Pacific Franc. As of writing this, every $1 US Dollar is worth around 100XPF. For example, a bottle of wine priced at 4,500XPF is roughly $45 US Dollars–certainly makes the conversion process easy. Even easier, check out www.xe.com for real-time exchange rates and a handy app you can install on your phone. Major credit cards (Visa, Mastercard, and sometimes American Express) are accepted at hotels, restaurants, and larger shops on Tahiti, Moorea, and Bora Bora. Smaller shops or more remote islands may accept credit cards with a minimum purchase. We recommend using credit cards as much as possible as they’re more convenient and provide the best exchange rate. Important: Be sure to contact your credit card company and bank in advance to advise them you’ll be traveling outside of the US (pre-empt any question of fraud) and inquire about any foreign transaction fees for using your card in the islands. You’ll certainly want to have some cash on hand for small purchases and the occasional tip. Euros and US Dollars are not widely accepted in the islands; therefore, local currency is best. We recommend exchanging your currency at the Los Angeles International Airport, or at a bank or ATM when you arrive in Tahiti. Bank ATMs are available at the airport in Papeete as well as on most of the major islands. Guests traveling to smaller or remote islands should ask their Tahiti Travel Specialist about ATM availability. We do not recommend travelers’ checks. While most hotels will exchange them, it will be for a lower rate. You will only receive a favorable exchange rate by taking them to a bank. The amount of cash you choose to carry is a matter of personal preference; however, a good rule of thumb is to have approximately $100-$500 per couple per week of travel. If you find you have a large amount left at the end of your trip, you can use it to pay down your hotel incidental charges before paying the balance with your credit card at checkout. Also, be sure to hold back a few Francs to purchase a couple of Hinano beers at the airport before your departure. The currency in Tahiti comes in both franc notes (paper money) and coins. Franc Notes come in the following denominations: 500F ($5USD), 1,000F ($10), 5,000F($50), and 10,000F ($100). Coins are available in the following: 100F ($1 USD), 50F, 20F, 10F, 5F, 2F, and 1F (about a US penny). The notes are beautifully colored depicting Tahitian culture, tropical flowers, birds, and marine life—all indigenous to the islands. You’ll be tempted to stash a few and take them home simply for their beauty. Coins are stamped with images of mountains, overwater bungalows, palm trees, sea life, and tropical flowers and plants. At the very least, these monetary works of art serve as beautiful mementos. Restaurants – A service charge is included automatically when you dine out which is shared with the server. We recommend rounding up or adding an additional 5%+ to your bill for service, depending on experience. Concierge Staff/Butler Service – If a guest uses the butler service at the hotel to help unpack, press clothing, arrange activities, etc., we would recommend tipping $20-$50 or higher depending on the extent of the services used. Also worth noting, many locally run properties have annual employee holiday fund that you can contribute to. You may inquire upon check-out and request a specific dollar amount be contributed for all to enjoy. When in doubt, contact your Tahiti Travel Planner specialist for specific advice about your upcoming trip.